I have seen CVs where people simply dump all possible information and expect recruiters to scroll through them to find out relevant details. The only destiny these CVs have is getting the 'delete' key pressed and landing up in the trash bins. HR people get hundreds of applications for a single position. They don't have the time to sift through your CV and see if each candidate suits their purpose. So, it is your job to make your CV as user-friendly, so that they can find the information they are looking for in a single glance. Grammatical errors and spelling mistakes not only look shabby, but they reveal a lot about your attitude. If I receive a business proposal with grammar and spelling mistakes, the first thing I would think is, "Is this person really serious about the business?" Similarly, a CV with grammatical errors and spelling mistakes will suggest that you do not care enough for this opportunity, you are lazy and you do not have an eye for detail. Nobody wants to hire an employee with any of these characteristics. So it's a given that such CVs are headed to the rejected pile. 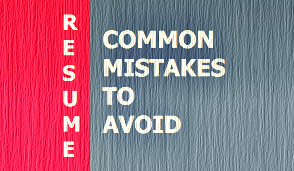 Your CV is not the place for you to talk about past failures or health problems, so keep them off paper. Some people may argue that almost everybody has the sense not to write about failures and health problems on CVs and while I agree with them, it's been known to happen. So this pointer is for those who do commit this mistake. Take a look at your CV again and if you have addressed any of these problems directly or indirectly, it is wise to edit them out. Many of us have developed the habit of writing about our current salary or expected salary on a CV, as we assume all prospective employers are going to ask about it, or that most job notifications require it. My humble advice to you is not to mention it on the CV, unless specifically asked to do so. While many employers will ask for it at this stage, there exist those who have a fixed salary for each grade. Also, there are those who are happy to negotiate the salary for the right kind of candidate. Writing your CTC on your CV may have you come across as an expensive employee, or in the case of your expected CTC, you may be asking for a sum far below what the potential employer is willing to pay. So it is better to bring money matters into the discussion a little later. When you appear for the interview you will get a better idea of the employer, which will help you negotiate better when the chance arises. Picture this situation -- you have a menu card from a nearby restaurant in front of you. You like the dishes they serve and the price is right too. You are impressed by the fact that they deliver within 10 minutes. You pick up the phone to make a call, but are not able to find the telephone number on the menu card. You look a second time, but you are still not able to find it. You're hungry and there's another menu card from another restaurant right in front of you, which looks equally good. Provide a phone number where potential employers can talk to you directly and don't have to go through your parents or friends. Keep the e-mail address small and uncomplicated to avoid any typing mistakes if employers decide to contact you online. Writing a CV is not a difficult task. The best person to do it is you. The only thing you need is to analyse your candidature properly and present it well. You will need to draft and re-draft your CV many times before you are finally happy with it. Kshipra Singh is a contributor to CareerRide.com, a website that offers a common platform for employers and candidates to discuss career opportunities.